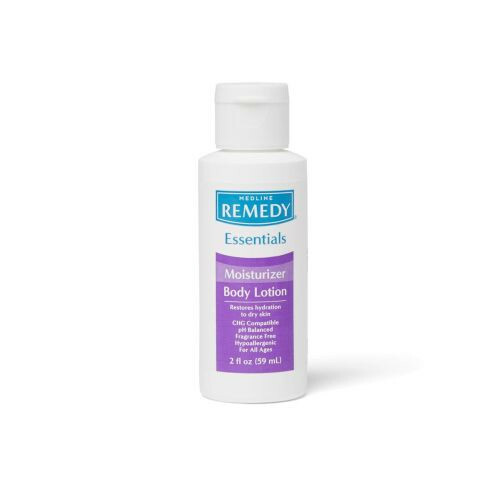 body lotion, moisturizing body lotion, Remedy moisturizing body lotion, MSC092MBL02, buy. 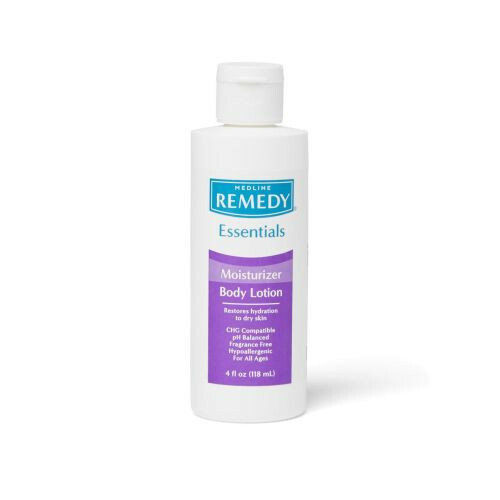 Basics Moisturizing Body Lotion by Medline is a body lotion that restores hydration to dry skin. It is intended for everyday use. Moisturizing body lotion is pH balanced and rubs in easily to absorb quickly into the skin. It does not leave the skin feeling greasy or sticky. This Moisturizing Body Lotion is unscented and is safe for application to any part of the body. 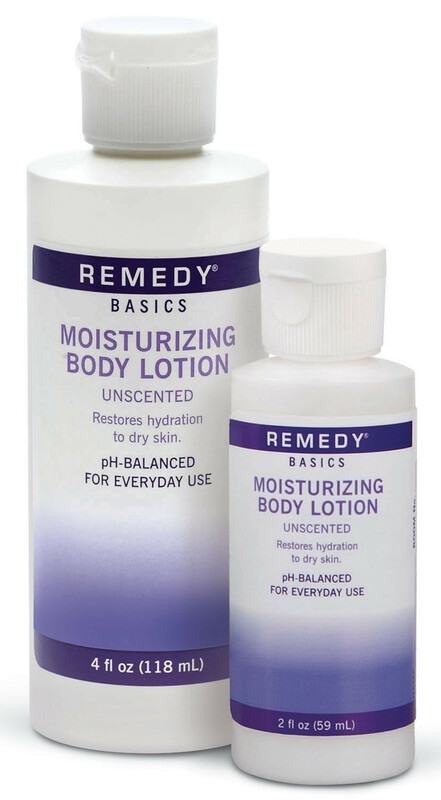 Basics Moisturizing Body Lotion by Remedy is CHG compatible and latex free. It comes in a flip top bottle in 2 oz and 4 oz sizes (59 ml and 118 ml respectively). Available individually or in a case of 60 or 96 depending on size. Body lotion that restores hydration to dry skin. Rubs in easily and absorbs quickly into the skin. Does not leave the skin feeling greasy or sticky. Safe for application to any part of the body. Available in 2 ox and 4 oz bottles. Sold individually or in a case of 60 (4 oz ) or 96 (2 oz). Awesome product. Introduced to this brand from hospital. Company had great rating and proved it by a flawless transaction and speedy shipment. Thank you! the exact product I wanted delivered in a Flash! This lotion is perfect for my skin. I first used it while I was an impatient at a hospital in Miami. It was replaced every day by the hospital staff as part of my toiletries .I quickly fell in love with it and asked my son to look for it on the internet and place an order. I am so glad that I found Vitality Medical while doing my search. Their prices are great and the service is impeccable, with rapid turnaround and lightning fast shipping direct to my door. I will continue to recommend them to everyone I know and i look forward to doing business with them on a regular basis. I was first given this product when in the hospital. I noticed how it even healed my skin just after a day or two. When I got home, I ordered more for myself and sisters. I love this product I had major surgery and like the previous reviewer I also ordered more because it made me feel great like no other lotion found in the market. And I do buy many brands this is highly recommend it. This moisturizing body lotion is effective and works well with patients that are interned for only a few days. The 2 ounce bottle is just the right size and our patients end up ordering more when they get home because it is effective.